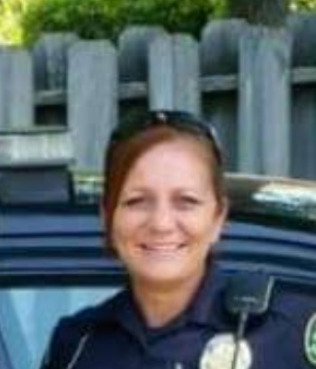 (Newser) – A white Jackson police officer has been fired after the Georgia Bureau of Investigation found she lied about being shot by an unidentified black man, AJC.com reports. Rookie cop Sherry Hall had only been on the job for three months when she was shot on Sept. 13. Calling in the incident on her police radio, she reported the perp had been a 6-foot, 230-pound black man and said she'd fired two shots after him after he shot her in the abdomen; she added her bulletproof vest saved her life, per WGCL. Her story sent Jackson into a panic, leading residents to think a dangerous gunman could be running around. But as investigators began looking into her story, it fell apart, including the fact that Hall had had two guns issued to her by the police department, one of which she allegedly used to plant a shell casing that she blamed on the supposed suspect, per GBI warrants for her arrest. I'm not surprised and it's not the first time a pig has lied. Remember GI Joe Gliniewicz? The cop whole stole, lied, then committed suicide after calling in and saying he was ambushed. And he was "America's Cop". cop of the year award!!!!!!!!!!!!! not!!!!!!!!!! !